In situ X-ray diffraction under wide and grazing incidence angles represents a powerful tool to online monitor the surface as well as the bulk of films during growth, for example by following the evolution of strain (and the strain relaxation). Furthermore, defects, such as threading dislocations and stacking faults, can be accurately determined as function of growth parameters, such as oxygen pressure, laser fluence, substrate temperature, etc. The mission of the research group is to understand the PLD growth of oxide thin films by performing time-resolved X-ray investigations within 1s acquisition time, using fast 1D and 2D read-out single photon counting detectors . In addition, in situ RHEED (Reflection High-Energy Electron Diffraction) is being used as a diagnostic tool to control the growth and surface morphology of thin films. The quality of film surface in term of roughness would influence the RHEED pattern and therefore, the growth mode as well as growth rate could be determined. Ferroelectric-Ferromagnetic (FE-FM) coupling in multiferroic materials (e.g., La0.67Sr0.33MnO3/BiFeO3 grown on different substrates). Current project In a collaborative project between the Institute for Photon Science and Synchrotron Radiation (IPS), the Institute of Microstructure Technology (IMT), and the Institute for Data Processing and Electronics (IPE), we strive to understand the impact of growth parameters on the morphology and structure of oxide films and how these would influence the microwave properties. The goal is to tailor the capacitance and loss factor by optimizing the growth parameter such as oxygen pressure, laser fluence, and substrate temperature. Complementary studies of the crystal structure and quality, as well as the surface morphology, are provided through a combination of several investigations methods. Ex situ X-ray characterization using diffraction methods in the coplanar and non-coplanar geometries (Grazing Incidence Diffraction, GID) is used in the analysis and determination of the strain and strain relaxation, as well as defect formation. We have recently developed a dedicated PLD (Pulsed Laser Deposition) chamber at the NANO beamline for in situ structural characterization during the growth process using high-resolution X-ray diffraction and surface scattering methods. Ability to perform correlated investigations involving in situ X-ray synchrotron and RHEED studies with the goal to understand the influence of growth parameters on the growth mode and on the final structure of (epitaxial) thin films. A laser beam with different available wavelengths (1064, 532, and 266 nm) can be focused onto the target with a motorized focus lens via a motorized mirror. Automatic change of the lens position and mirror angle with the substrate-target distance to maintain a constant fluence and beam position on the target. Availability of eight different targets for sequential heteroepitaxy of diverse multilayer and superlattice structures. Equipped with a differentially pumped RHEED gun operational up to 30 kV and a RHEED screen for imaging the electrons from the RHEED gun diffracted on the sample surface. Adjustable distance from 35 to 100 mm between the target and the substrate. The manipulator supports the target rotation and a sideways toggling motion for even targets. The load lock chamber includes a sample storage rack that can hold up to six samples. Photos of the PLD growth chamber. 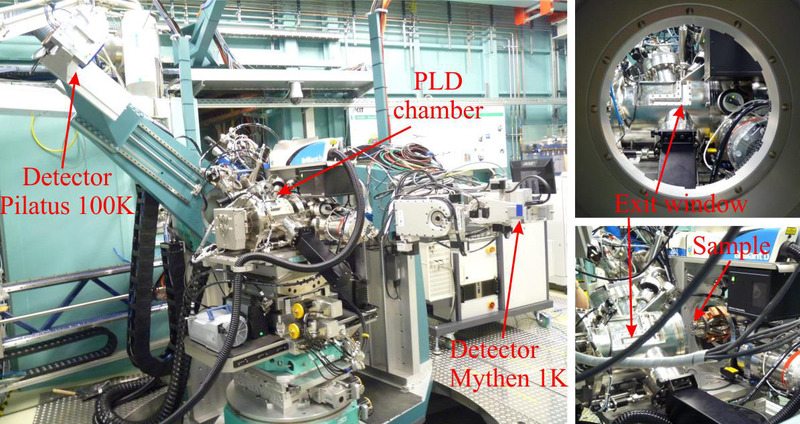 The chamber was designed to be coupled to the heavy duty diffractometer at the NANO Beamline, which features two different detection systems: a single photon counting linear detector (Mythen 1K), as well as a two-dimensional pixel detector (Pilatus 100K, Dectris, Switzerland). Our in situ X-ray diffraction PLD chamber contains high purity beryllium windows, allowing for high X-ray transmission. The entrance beryllium window has a horizontal angular opening of 55°, while the exit beryllium window, built in L-shape, has vertical and horizontal openings of 55° and 70°, respectively. S. Bauer, S. Lazarev, A. Molinari, A. Breitenstein, P. Leufke, R. Kruk, H. Hahn, and T. Baumbach, J. Synchr. Rad. 21 (2014) 386.